The day arrived for Edith to wear her dress. She was proud and determined to accomplish the task at hand – to march with the others for civil rights. It was a shame that in 1963 people had to fight for their humanity, but she knew what this was like. She’d seen it before. Her eyes filled with tears thinking about how some could be so cruel based on the color of one’s skin. Weren’t we all God’s children? At the march, the group of protesters gathered at the church to pray and give ground rules on how to proceed. It was to be peaceful. Marchers were to ignore insults, lashing out via spit, or some other defamatory tactic. And in the event of being physically assaulted or police brutality, marchers were encouraged not to fight back. Edith understood the rules. The group began to move down the street from the church towards the center of town. Edith felt eyes watching her – not just the lines of men and women yelling racial epitaphs, but also some of the marchers. A little black girl in the line looked at Edith’s arm. When Edith noticed, she pulled down her sleeve. Edith wasn’t sure how to answer. The little black girl’s mother grabbed her arm and scolded her for asking questions. “It’s alright. She’s just curious,” Edith said trying to ease the situation. The mother hesitantly looked at her while still holding her daughter’s hand. The little black girl looked from her mother to Edith to figure out why her mother was looking that way and why no one would answer her questions. Edith slowed her steps so that she would fall towards the back of the line. She didn’t want to make the mother anymore uncomfortable than she probably was. Besides her purpose there was to take a stand. As the marchers got closer to town, locals were becoming bolder. Some walked along side the group cursing and displaying their distaste for the demonstration. Then suddenly someone in the group was hit by a local welding a baseball bat. There were screams when it landed on its target. Edith craned her neck to see. It was the mother. Edith pushed through the crowd to try to help them. It was difficult because chaos had ensued. Some of the marchers were fighting back, others were being assaulted, and yet there were those trying to stick to the rules and continue to march. There was blood everywhere. The little black girl was crying. Edith grabbed her and shielded her from the bricks and blows that were coming from every angle. But what she didn’t expect was to see a man in her face with a rifle. Edith was stunned, but not afraid. She stood up with the little black girl behind her. She looked the man in the eyes with fierceness and determination. She realized that he wasn’t a man after all, just an adolescent boy. She yanked the gun from his hand. He punched her. She fell. He took the gun and tried to fire it. The little black girl screamed. The gun had jammed. A marcher pulled Edith and the little black girl to safety. The little black girl held on to Edith like she was her new mama. Edith couldn’t let her go – especially since she didn’t know the outcome of her real mother. Hours later, she’d learn that the woman had died. The little black girl was in the care of relatives. Her name was Marilee. Edith passed away in 1995 at the age of 72 – her daughter and grandson by her side. Before her last breath it was as if she had so much to say but she struggled for air and time to get the words out. Edith hadn’t talked in detail about her life. Her family knew she was a Holocaust survivor and that she had marched alongside African-Americans in the Civil Rights Movement. Edith made no fanfare about these things. What was the point? To her family, Edith was mama and grandma – the strong matriarch of the family who went about life without complaint or drawing attention. She helped others when she was able. So it was not a surprise that many of her belongings went to the local thrift shop whose mission was to help the community. One day, a woman went to the thrift shop looking for clothing from the ’60s. Her daughter was participating in a play celebrating Martin Luther King’s birthday. The woman scrimmaged through the racks and boxes of clothing and items. 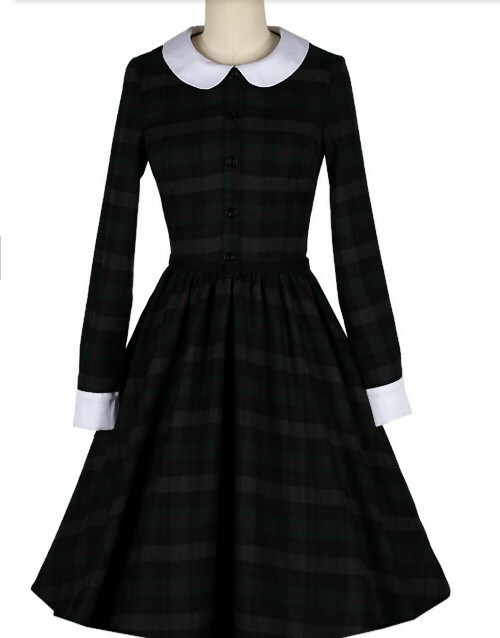 She jumped back in shock when she saw the gray plaid dress with the white Peter Pan collar and cuffs. The woman looked at the bottom left hem to see if it was still there. It was, but faded. It was a stain of her mother’s blood. Marilee held the dress close to herself. She couldn’t believe it. Tears flowed from her eyes. Her thoughts retraced history, remembering the baseball bat cracking her mother’s skull, and the woman with the numbers on her arm who kept her from further harm. Marilee asked the thrift shop clerk if he knew where the dress came from. Like most donations, he either had no direct record of who gave it or could not share the information. Marilee purchased the dress anyway. It was an heirloom weaving her history into the woman with the numbers tattoo. And just like most precious heirlooms, she had it encased. She made sure to document the events of the day in 1963 and to share the story with her daughter so that it could be passed down throughout the generations. She also included the history of the Holocaust so that the maker of the dress could be remembered. Amazing how one dress created a thread through history.